Sun Li lived at the edge of the woods. Each morning after she did her chores, she’d go for a long walk. Sometimes she’d see a fox running through a hollow tree that had fallen to the ground. Other times she’d see squirrels gathering nuts, or nightingales sitting on a branch, singing their beautiful songs. There were always pretty butterflies fluttering about, and bees buzzing by as they flew around the peonies and chrysanthemums. One day Sun Li saw a bird nest lying on the ground. It had four white eggs in it. She sat quietly and watched for a while, but no mother bird ever came back to take care of them. She picked up the nest and carried it home. "Mama, look what I found?" She showed her mama the nest. "The mama bird must have been killed by a wild animal. I want to take care of the eggs and let them hatch. May I, Mama?" Sun Li pleaded. "That’s a big job for such a young girl. You need to keep them warm and after they hatch, you need to feed them and watch out for them. But the hardest part is that you will learn to love them and then you must let them go. Birds should be free to fly where they please. Can you do that, Sun Li?" her mama asked. "Oh yes, Mama. I want to take care of them," she replied. Every day Sun Li made sure the eggs stayed warm. She left them inside the nest of twigs. She let the sun shine on them during the day and put a blanket over them at night. One day she noticed a crack in one of them. "Mama, I think the eggs are going to hatch," she giggled. Her mama came to see. "You’re right, Sun Li. They are ready. Watch carefully but do not touch and do not help them. It makes them strong to fight their way out of the egg. If you help them, they will be weak and die," she warned. Though it was difficult to do, Sun Li sat patiently and let the chicks struggle to come out of the shell. Soon the nest was filled with four fluffy chicks. At first they were wet and brown looking but when their feathers dried, they were yellow and soft. CHIRP! CHIRP! CHIRP! After a few hours they had gained enough strength to climb out of the nest. "You must take them outside and show them how to find seed. Sprinkle some on the ground and let them search for it themselves. Do not put the seeds right in front of them. Make them work for it. It will make them stronger," Mama cautioned. Sun Li did as she was told. 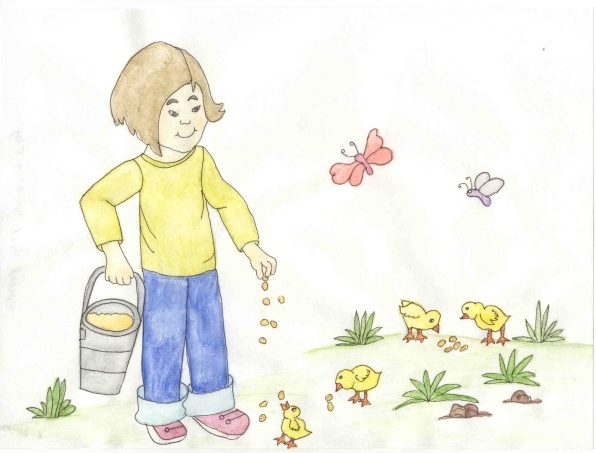 She took the fluffy, yellow chicks outside into the back garden and put them down among the grass and tiny white daisies. She tossed seed all over the grass and sat back and let them find it. At first the chicks ran about, unable to find anything. Sun Li wanted to show them where it was, but she remembered what her mama had said. Soon all four chicks found something to eat. PECK! PECK! PECK! Each day they grew a little bigger and started eating more and more. Sun Li had to take a whole bucket of seed out to feed them with. Sometimes the chicks would find a fat, juicy worm to eat. Sun Li laughed as she watched a chick trying to gobble one down. Mama came outside to watch. "Soon the chicks will start flapping their wings and will want to fly. You must allow them to, even if they fall or bump into a stone. Do you understand Sun Li? It will make them strong. One day they will have to live in the woods and must know how to take care of themselves." "I understand, Mama," Sun Li said. One day two bright orange butterflies came fluttering by. One of the chicks tried to run after them. Sun Li giggled as it chased the butterflies from flower to flower. She was surprised when it started flapping its wings. "Mama! Come outside. The chick is trying to fly," she called. Mama came outside to watch. "They aren’t babies anymore, Sun Li. Look at them. They are turning into birds. Soon they will fly off into the woods." Sun Li didn’t want them to leave. She loved her baby birds, but knew what her mama said was true. A few more days passed and all four chicks were flapping their wings, trying to fly. They could fly a few feet and would fall. Sun Li left them alone and let them spread their wings. A week later, Sun Li went outside to feed them. Days before she had made a special house for them. "Come here, little ones," she called. She was carrying a bucket of seed and put it on the ground. She looked in the little house. The chicks weren’t there. "Where are you?" she called. She looked all over for them but they were nowhere to be found. "They’re gone," she sighed, feeling very sad. "I didn’t get to say goodbye." She sat down in the grass and started to cry. Just then she heard some chirping sounds. CHIRP! CHIRP! CHIRP! Her four birds came flying from a tree branch and landed on a large rock. Sun Li hadn’t noticed how big they were getting. Their feathers were brown and white and they were beautiful birds now. CHIRP! CHIRP! CHIRP! They sang a pretty song for Sun Li and then flew into the woods. "Goodbye, my babies. You are free to fly as you please. Be safe," she called out. She stood watching them flutter from branch to branch. "Spread your wings and fly," she shouted, wiping the tears from her eyes. Her mama watched from the window. A tear ran down her cheek. She knew Sun Li would be sad and miss them, but was proud of her daughter for caring for the chicks and allowing them to be free when they were ready.